New to the market this week we have: fresh herbs, kohlrabi, and lettuce from Pisgah Farm, escarole, cilantro, scallions, chard, kale & napa cabbage from Picadilly Farm, red & gold beets and red & green boston lettuce from Harlow Farm! Also Currently Available This Week: arugula, bok choy, chard, kale, leeks, lettuce, mushrooms, potatoes, radishes, rhubarb, salad greens, spinach, strawberries, tomatoes, variety of herbs, and more! We also have delicious bread, yogurt, pudding, cheese, eggs, maple syrup, granola, sauces, condiments, and local meat. New Buyers: Welcome to new buyers - Lisa from Apple Hill Center for Chamber Music and Keene Housing Farm to Family Buying Club! 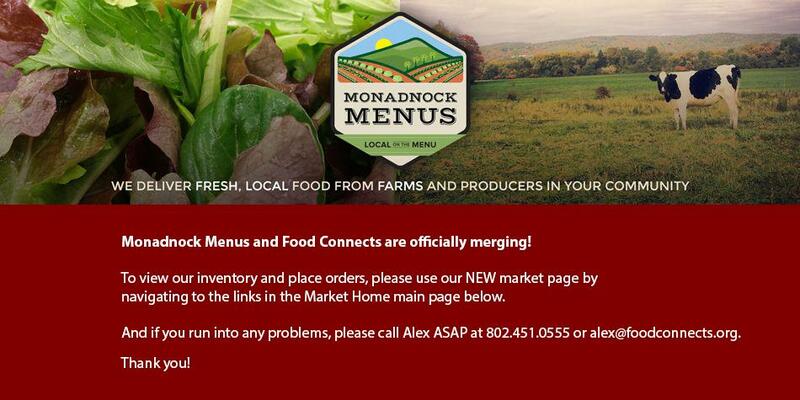 They have both begun supporting our Monadnock Menus producers in the past weeks since our last e-newsletter. We are thrilled to have you on board! Special on Yo Yummy 12 packs: For the next week there will still be a special price on these items - $7.50/pack, down from $9.00/pack! June Harvest of the Month is Herbs! Check out the website for some great recipes and free educational materials for your cafeteria or shop. July Harvest of the Month is Berries! Picadilly Farm is a Certified -Organic, Community Supported Agriculture and local wholesale farm in Winchester, NH.